Medieval armour worn, Polishing steel finish: Lucid / Burnished, reproduction of a fifteenth-century armor. Made of steel and handmade. Medieval armor burnished, consists of a helmet with horse tile spheroid at low ridge. Fans raised on the nose, docked on the right. Vents. View prominent forehead, cracked eye backward, rivets and coietto insurance. By ruff collar, chest to foot in envelopes, without remains, ribbed neck in the middle to slightly concave, rising in the middle rounds and decreased axillary and oblique sections in duplicate. Two ribs to fall below the neckline in controcurva open cusp; back with little batticulo modeled. Tassets shaped and machined, balanced, buckled the front flap to protect the upper thighs with forked bell. Bracelets integer symmetric and shoulder blade of guardascella, rounded front and rear wings slightly larger. Medieval Knight armour completely wearable and functional . Medieval Knight armour includes all parts of the armour, which are shown in the image. 1- Bascinet Helmet, closed Helmet manually made of carbon steel wearable, used to heavy cavalry in the late middle ages (thickness to choose: 1.2 mm, 2 mm). We propose a series of Knight Helmets, they are bascinet Helmets with visor, these particular models of a bascinet have a double hinged visor and bevor on both sides by leather straps and buckles, and then can be disassembled. When the Helmet is worn, visors cover the entire face; the first visor has slits for the eyes, while the second has ventilation holes. This design is ideal to fight but also for the parades of medieval re-enactment. 3- Cuirass part of the medieval armour to protect the torso and back, made of Pectoral and back armour. Cuirass is made to your measures to be indicated in the order (chest circumference at breast level, total height and weight). 4- Pauldrons (Spaulders) to protect shoulders, this part of the armour covers the back; the shoulder straps are anchored to cuirass via leather straps. 5- Armour to protect the arm, consisting of three parts: the upper cannon (forearm protection), the cubitiera (elbow protection) with lateral wing and lower cannon . They are articulated between them via hinged plates, arched and set by sliding rivets. Choice of four models of arms, Art: B001- B002 - B003 - B004. 6- Medieval Gauntlets, medieval gloves to protect hand and wrist. Choice of six models knobs or armour gloves, Art: B100 - B101 - B102 - B103 - B104 - B105. 7- Poleyn, Schynbald (greaves), medieval Cuisses items of armour that protects the leg, articulated in such a way as to give maximum mobility to the fighter. 8- Sabaton armor or Solleret - Articulated shoes in defence of the foot with the end of different formats of your choice, shoes are made of cold rolled steel. Choice of six models of armour shoes: Art: G130-G131-G132-G133-G134-G135. All our reproductions of medieval armour and thus also this Medieval Knight Armour are faithful reproductions of medieval armour, they can be worn for re-enactment events to create your ideal armour. Handmade armours, suitable to different sizes, using leather straps through external adjustable buckles, can be produced on request. They are handmade forged armours from steel plates with no modern manufacturing processes, such as bending and polishing, the thickness can be chosen between the following dimensions: 1.2-1.5-2.0 mm. Medieval Knight armour entirely made in stainless steel and handcrafted by artisans in Italy, equipped with leather straps and external adjustable buckles to be worn. Dim. 185 x 85 x 43 cm - weight 35 kg. Made of handcrafted steel and fully wearable it has its wooden base and support. 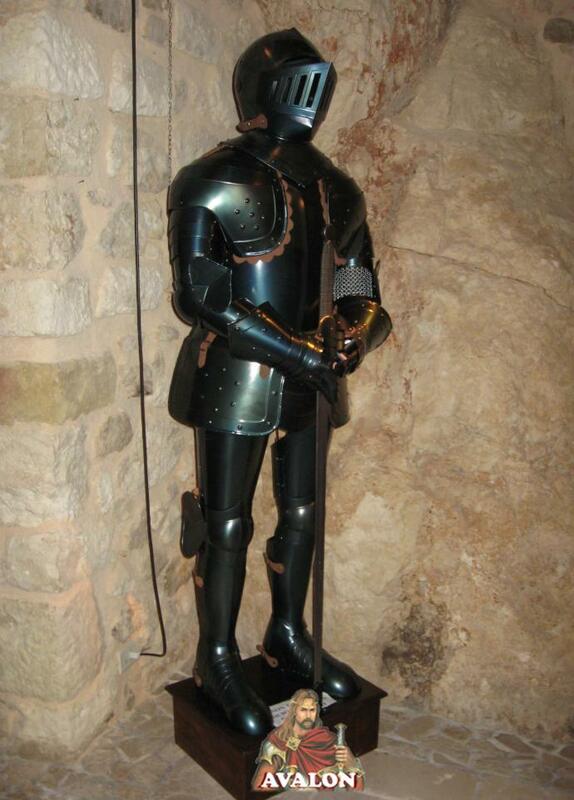 On request you can have the Medieval Knight Armour in stainless steel with an extra of 340 €. - Material: 1,2 - 1,5 - 2,0 mm (16 ga -14 ga) steel. - Weight: 35 kg (77 lbs) approximately. Medieval armour have undergone many changes during the middle ages and the Renaissance, because in the middle ages the art of medieval armour manufacture was very evolved, many Knights and noblemen of the time had developed their own style in armours , as if they were taking part in a stylistic competition rather than a military one. And it is for this reason why the medieval armour section is so wide and rich in different styles. This armour is manufactured in Italy, faithful to the ancient artisan tradition of Italian gunsmiths, which since the middle ages has been passed down from generation to generation and come up to us. We are the only ones to be able to offer you a wide range of medieval armours with high finish from the functionality point of view, ensuring maximum comfort and protection during the fights, an outstanding product from the artistic point of view and from the low price, reducing costs due to commercial intermediaries, with the opportunity to customize the medieval armour according to your measurements.